tournament, the family dog, or a quiet evening conversation session. The spacious back deck is outfitted with comfortable Adirondack chairs and a gas grill. 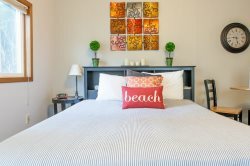 Cannon Beach Vacation Rentals offers these near-by homes as well: Haystack Roost, Beach Bijou and Elliott Way Cottage. This is a very cute, comfortable house with lots of room for everyone. We had 8 adults and a dog in the house and it never felt cramped. Close walk to downtown Cannon Beach and to the beach itself! Would definitely book this one again! This beach house is great. Super close to town, but private enough for peace, quiet, and relaxation. Lots of space with great social areas. We recently stayed at the Spruce Street Retreat and it was everything you could ask for in a weekend getaway. The house is big, but cozy. The kitchen was well stocked (and not with cheap junk), the beds were very comfy, and the couch was amazing. There was six adults there that weekend, and we rarely left the house - except to go to Pelican Brewery, which is a 4 minute walk away. I will definitely be staying there again!